The Open Space Framework constitutes a variety of open space typologies that function to create a beautiful, welcoming, animated, pedestrian-oriented environment and destination. 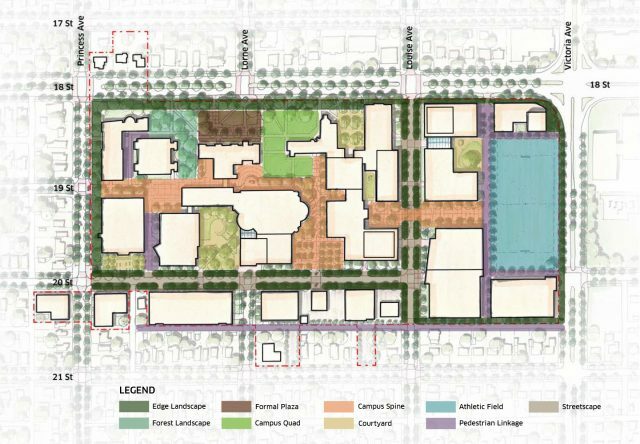 Each open space typology is intended to contribute holistically to accommodate a variety of needs, to enhance the tree canopy, to socialize the Campus, to engage and welcome the community in, and to foster healthy living for all. The open spaces are one of the best opportunities to represent and support Indigenous peoples’ culture and history, through art, landscape design and planting, and through programming open spaces. The open spaces should be used as a pedagogical tool for the University, with opportunities for outdoor learning and teaching. At the scale of the University, the Framework provides a variety of spaces to meet student and faculty needs, increasing the opportunity for social gathering, lingering and studying, learning, recreating, and for events and ceremony. In addition, at the scale of the community, it functions as the day-to-day playground and destination for the surrounding neighbourhood and local community for recreation, lingering, walking, cycling, and partaking in Campus’ events. At the scale of the city, the Framework responds to creating a University District, with spaces that can accommodate citywide events and position the University as lively and animated throughout the day and year. Safety and security are priorities to be addressed in design. Accordingly, all open spaces must be well lit in a sustainable way, and visible and accessible from numerous vantage points both internal and external so that they are safe and comfortable places to be. The following sections provides an overview of each of the open space typologies defined in the Framework.